The Ashlander Style is a crafting skill that can only be learned by reading the chapters of the Crafting Motif 48: Ashlander book. These chapters can only be found in reward containers obtained from daily quests given by Huntmaster Sorim-Nakar or Numani-Rasi. 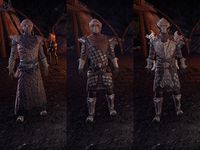 Crafting Ashlander items requires Ash Canvas. Like all styles, it is purely cosmetic. Items will have the same stats regardless of the style you use. This style shares its name with a different, uncraftable style seen predominantly on Ashlanders in mainland Morrowind and some in Vvardenfell.